Here is the Download Link for the latest version ! 1. Single Posts now show the previous post and the next post at the top. 2. Added a file called “notfound.php” which gets included whenever you get a 404. 3. Changed the profile image that shows up in the sidebar. Bug Fix in functions.php approximately line number 150. Updated to version 3.3 on May 25 2007. The changelog.txt within the theme will show you the changes made for this version. 1. Fixed the height and width of the header image in the functions.php to be 760px and 200px respectively. 3. Now if you do not disable the shadow effect applied to images, you can use class=”noborder” for those img tags. 4. Minor style improvements in style.css. Updated to version 3.2 on Mar 14 2007. The changelog.txt within the theme will show you the changes made for this version. 1. Highlight the author’s comment. if the commenter’s email is same as the site admin’s email, it is highlighted with the border around the comment. 3. Emoticons will not show the shaded background now. 4. Removed the hard coding of “Links” as a title for the blogroll. Also made sure it looks the same as other sidebar content. Updated version 3.1 Feb 12 2007 => works with both WP 2.1 and WP 2.0 series. I am very proud to announce the release of MistyLook V3.0, in line with the release of WP 2.1 . 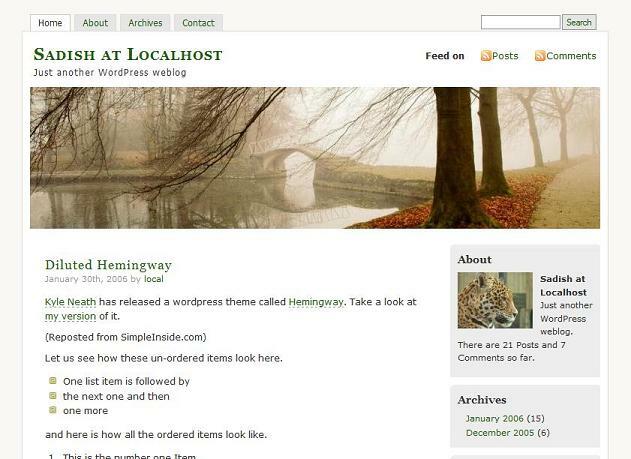 This is the first WordPress theme to accommodate “Custom Image Header”. You could easily upload your own image for using it as a header to this theme. Look for a new tab under presentation, after activating this theme. * Overall improvement to the look and feel. This was causing problems with Share This and other plugins, and so it is fixed. to comment on an attachment in a post. * Now supports Trackback URI and Comments Feed when viewing single post / page. * About Section on the sidebar is made into a widget. * Support for Custom Image Header – An Amazing way you can create your own header with just a few mouse clicks. * WordPress 2.1 puts both link categories and post categories into one table. when picking a category for Asides, MistLook is made to list only post categories. * following number 5, about section is made to call to the widget’s function. * changed the title for category list to be “Categories”. Previously it was called “Tags”. * made to use the 404.gif that is added to the img folder. * added cols and rows to the textarea tag. and much more for you to explore.